Belen Soto was a Litchfield Elementary School student in the 1940s. It was a different time, when young women were discouraged from attending college and pressured, if their desires ran contrary to societal norms, to instead remain in their place and focus on starting a family. But she fought for her desire to pursue higher education and became the first Mexican-American person from the Southwest Valley to graduate college. And Litchfield Elementary School District is honoring her by naming their newest elementary school after her. The district celebrated a cornerstone ceremony, Jan. 9, for the new Belen Soto Elementary School, 18601 W. Campbell Ave., Goodyear. The namesake and her family, as well as governing board members, district administrators, community leaders and students attended. Governing board member Kimberly Moran, who spoke at the ceremony on a brisk morning near the foothills of the White Tanks, said Ms. Belen Soto is a symbol of the importance of education for all individuals. “It is a privilege to honor this land and the people who farmed it for generations before I was even born,” she said. This will be the district’s 16th elementary school and will officially open Aug. 5. Ms. Soto’s father was a foreman on Goodyear Farms, where she grew up, not far from the location of the new school, which is part of the master-planned housing community, Sedella. Ms. Soto was the 1954 valedictorian at Litchfield High School, graduated with a teaching degree from Arizona State College at Flagstaff, which became Northern Arizona University. Litchfield High School merged into the Aqua Fria Union High School District in the 1950s. That district served the area at the time. The high school reverted into Litchfield Elementary School. Ms. Soto became a teacher after she graduated from college. But she said she had to convince her mother and father that higher education was the right thing for her, even after one of her high school teachers encouraged her to go to college, and spoke to Ms. Soto’s parents personally. She was convinced her parents would not let her leave because they had no money, Ms. Soto said. However, after her teacher visited her mother, the young Ms. Soto arrived home to her mom crying. “She says, ‘so you want to go to college?’ in Spanish. And I said sí mama. ‘Do you really want to go to college?’ Sí, mama. ‘But do you really, really, want to go to college?’ And I said sí, mama. And she hugged me and said, ‘you have my blessing.’ Then we were both crying,” Ms. Soto said. Ms. Soto is not the only former Litchfield High School student to take on the namesake of a public building. Former President of Arizona State University Lattie Coor gives his remarks during a cornerstone ceremony for Belen Soto Elementary School. Mr. Coor and Ms. Soto attended Litchfield High School, class of 1954. The two have been long-time friends, dating back to when Ms. Soto was valedictorian and Mr. Coor was salutatorian. Lattie Coor School in the Avondle Elementary School District and Lattie F. Coor Hall at Arizona State University was named after its 15th president. The ASU building houses a number of schools and opened nearly 15 years to the day — January 7, 2004 — before Belen Soto Elementary School was dedicated. The two also happen to be friends and graduated from Litchfield High School the same year, Mr. Coor finishing as Salutatorian. 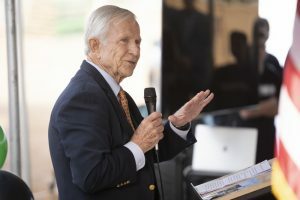 He spoke at the cornerstone ceremony, praising her drive to strive for bigger and better things and how significant the dedication was because her life is rooted in the Southwest Valley. 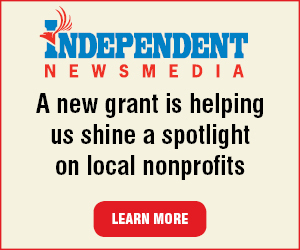 Namesake: Belen Soto was the first Mexican-American person from the Southwest Valley to graduate from college, according to the Litchfield Park Historical Society. Ms. Soto married Rudy Moreno, her first-grade sweetheart from Litchfield Elementary School. Mr. and Mrs. Moreno will celebrate 60 years of marriage next summer. Fund source: Voter-approved bonds, adjacent ways and other means. Amenities: Baseball, softball and soccer fields, as well as a gymnasium, music room, art room, science lab and media center.